A vibrant, liveable city needs residents who are fulfilled and happy. Incorporating even a little physical activity into your existing daily routine can bring loads of benefits. Apart from doing great things for your health, getting active can have a positive impact on Adelaide’s future too. 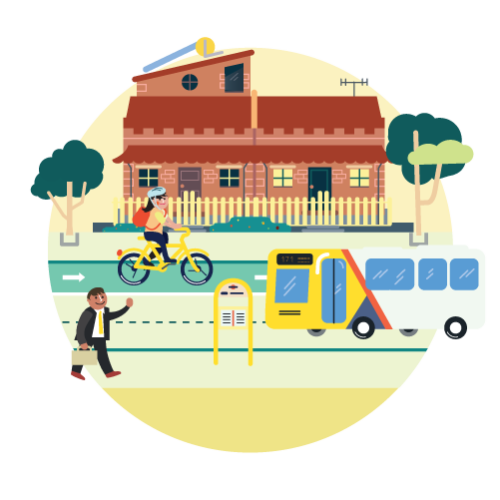 By riding a bike to work instead of driving, you’re freeing up our transport networks, reducing your environmental impact and contributing to minimised healthcare costs. The Update has six high-level targets to help us measure our progress on how Greater Adelaide will become a more liveable, sustainable and competitive place. We will create greater opportunities and safer conditions for walking, cycling and accessing public transport. This will include prioritising new walking and cycling networks, connecting parklands and the Adelaide Riverbank to the city, improving street lighting and making housing close to the CBD more accessible. The Update has 14 policy themes which outline the policies and actions which will help us achieve our targets. The most relevant ones are listed below.